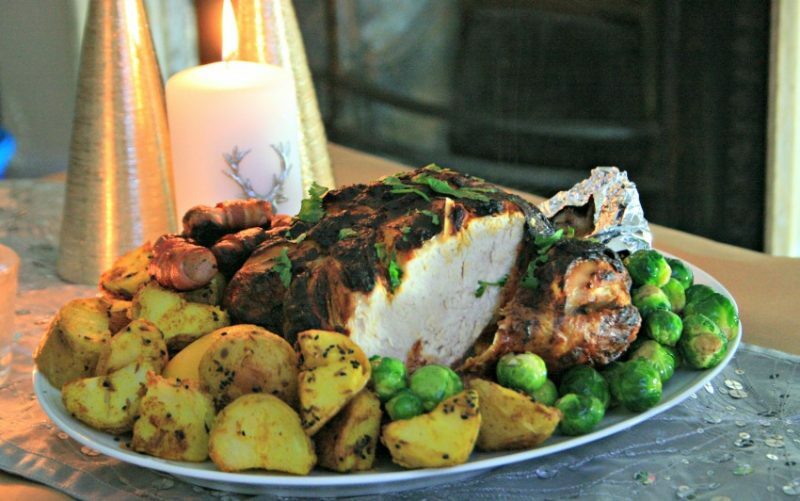 A beautifully Indian spiced turkey recipe to give your Christmas day dinner the zing it needs! I believe there are a lot of people who don’t care that much for turkey on Christmas but tradition goes that it’s the most popular meat to eat on Christmas day. But have you ever thought of spicing things up a bit? Adding a few herbs and spices can make all the difference, however not be too drastic that everyone will get confused about which day it is. That’s where my wonderful Indian spiced turkey recipe comes in. Don’t be afraid to play around with the spices, you could add ginger if that’s your thing, you could even add cinnamon. It will just give the turkey a lovely flavoursome skin and a hint of spice, this recipe is not drastic it is very subtle. Adjust the chillies to heat preference, I used a whole medium sized red chilli in this recipe, and I took most of the seeds out, however it could definitely have taken another chilli in the mix. Obviously chilli heats vary so do what suits you and your family and the people you are cooking for. To accompany the Indian spiced turkey (okay, the beady eyed ones among you will notice it’s really a chicken but turkey is ‘sacred’ here…only for Christmas & Easter, but fear not I have allowed more than enough marinade for a very large turkey) I made some rustic roast potatoes. I kept the skins on as they make for lovely crispy potatoes, parboiled them and then tossed them in a little hot oil, loads of cloves of crushed garlic in their skin, a handful of cumin seeds, a handful of nigella seeds and a sprinkling of turmeric, salt and pepper and they were cooked in the oven as normal. Delicious! The recipe is super simple and quick and don’t worry if you don’t have a blender to blitz the marinade ingredients just crush the garlic really well and into a paste and use chilli power instead of fresh chilli, and then just mix all the ingredients together. 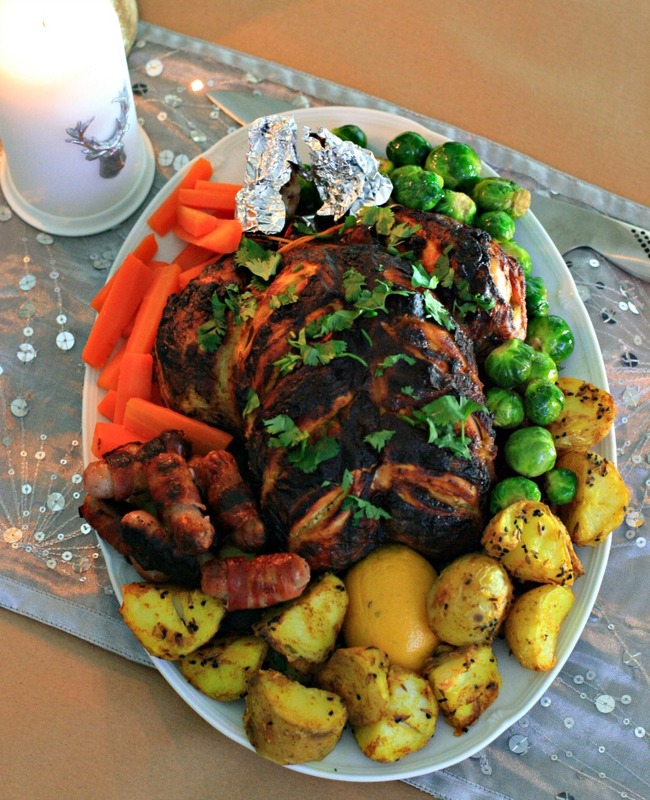 A great recipe to jazz up the Christmas dinner, aromatic Indian flavours for an Indian spiced turkey, gluten free too! Put all the ingredients, except the turkey, into a small blender and blitz until smooth. 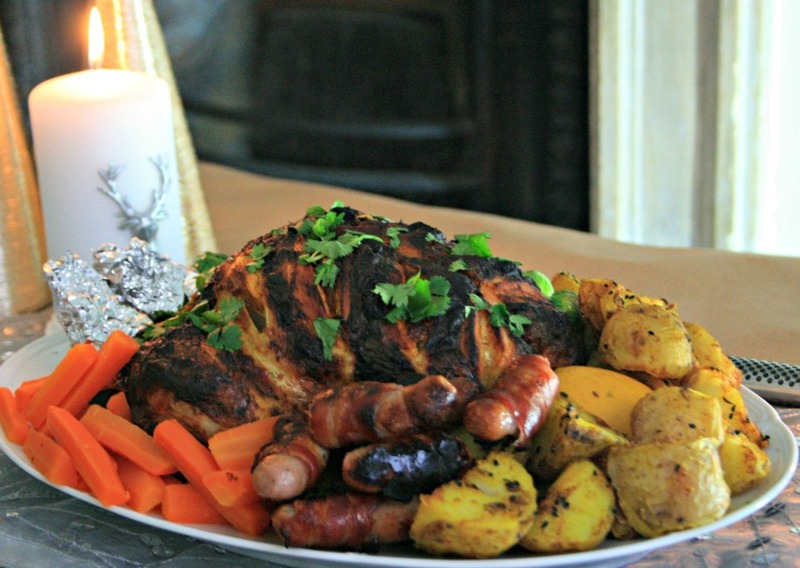 Do you give your Christmas turkey an unusual twist or have it in the traditional way? Loving the twist on a traditional roast. Lovely warming spices.